This is a card I made for the Great Swaps Girls Any Size/Shape But A2 swap. I love these little circle cards! I cut out my circle, purposely leaving a flat side where the fold would be if you made a full card (our swaps are for fronts). I cut strips of Summer Picnic dsp, attached them, and trimmed the excess. I added brads, ribbon, a sentiment, and some piercing for details. The apple body is cut out and popped up for dimension. I would have put CE on the apple to make it shiny, but it always turns red ink pink. Does anybody know if heat setting red ink prevents this? I'm going to try it and find out. One of these days. And for the news: I am going to be a contributor to Natasha Trupp's new blog Clean & Simple Stamping! I am very excited and can't wait to get started! Love this card!! The colors are fab!! This is so cute Becky! I wish I signed up for this swap! Super cute card Becky!! You will do wonderful helping out with her blog!! Good for you!! Oh, this circle card is adorable, Becky! Congrats on the big news - I didn't even know about Natasha's new blog! Your cards are a perfect match to her Clean & Simple Stamping style! love your circle card!! woo hoo to your big news!! And congrats on being a contributer to Natasha's blog, you'll be super!! very cute! I love all the colors! Congrats Becky - such exciting news! 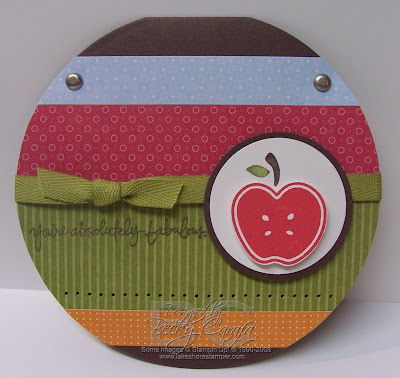 Adorable card - the color, the layout and totally agree with you about circle cards...they're just so much fun! This is a fabulous card! Nice job with the swap Becky. Too cute! Love the papers with the stamp! I love this, Becky ... the papers, sentiment, shape. Everything about it is fabulous! Oh my stars - I love, love, love this!!!! I'm so excited that you'll be on the CAS blog!!! Congratulations! Oh, and your card is adorable! Love your circle card Becky!! The popped up apple is perfect too. You know, you could always emboss Real Red Craft ink with clear EP to get the shine that CE would give without changing the red to pink. Just a thought! Congrads, Becky!! I can't wait to see what you do there...I love your style!